Who have more chances of winning 2019 Lok Sabha elections? Group Discussion Ideas > Political GD Topics > Who have more chances of winning 2019 Lok Sabha elections? Popularity of our Prime minister Narendra Modi. Many polls and surveys revealed that Narendra Modi is the most beloved leader of the present India. Modi has fans from all over the world. Modi-led government raised our country’s status in the world. During the NDA rule, India improved bi-lateral relations with many powerful countries. There is no strong opposition to NDA government yet. There are many wonderful schemes and programs that are launched and implemented by NDA government like Make in India, Swachch Bharath, Digital India etc. Many positive results were seen in NDA rule such as improvement in the ease of doing business, boost to startups, rise of cashless economy etc. Recenty Telugu Desham Party (TDP) exited NDA (National Democratic Alliance) [NDA is the name for coalition of BJP and its allies]. TDP was the major ally in south India for BJP. Some other regional parties – SBSP, BJDS are also planning to withdrew from NDA. If this process is also followed by other strong allies, it will be a big blow to BJP. Failure of Demonetization. This can be evident from the recent RBI annual report. Along with that, common people suffered a lot during the demonetization move. This resulted in angst of some people. According to domestic and international media, intolerance in India towards minorities after BJP came into power. BJP lost in the by-elections in Rajastan, Uttar Pradesh and Punjab, that were conducted in 2017 & 18. It also got lesser votes in Gujarat by-elections when compared with the number of votes it got in 2014 lok sabha elections. Unemployment problem is not solved during NDA rule. Congress has many leaders who have a great political experience such as Dr. Manmohan Singh, Ghulam Nabi Azad, Chidambaram, Renuka Choudhary, Shashi Tharoor etc. A recent phenomenon of Anti-Modi wave is a big plus for INC (Indian National Congress). INC already has a decent number of allies. And now it is trying to add more parties into its coalition. For example Mamatha Benarjee of Trinamool Congress is already in talks with Sonia Gandhi of INC. Recently Rahul Gandhi, the Prime Minister candidate of Indian National Congress is very active on social media and building his reputation. Congress has most of the minorities’ support. Anti-Modi wave may not guarantee that people will not vote for the local BJP candidates, who have a good reputation. People are increasingly hating dynasty politics. Just because Rahul Gandhi is from the Nehru family, people may not want him as their leader. Rahul Gandhi has no significant achievements in his political career. Till now, all the Prime Minister candidates have strong political careers. Rahul Gandhi still needs to prove his abilities as a good leader. Congress has many wonderful leaders who have many years of political experience. Choosing Rahul Gandhi as PM candidate by sidelining other leaders is a big negative mark for Congress. People who are eagerly looking for alternative to Congress and BJP, will look forward to Third Front. It is the right time for the formation of third front. 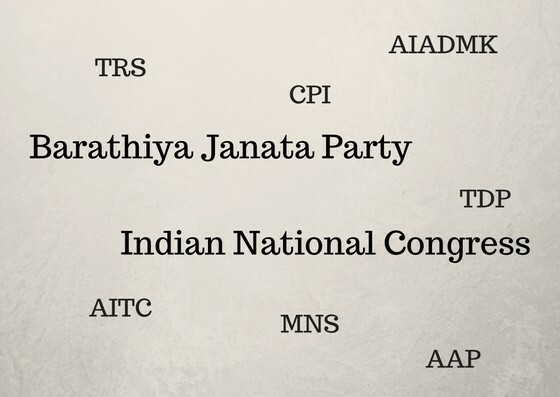 Several parties are actively working for the third front formation. TRS, TMC/AITC are some of them. TRS leader called other regional parties to form “Federal Front”. But the road to the formation of third front is not smooth. There are many doubts whether the formation of third front is successful or not, because every leader is planning to lead the third front and almost no one is ready to join other leader-led coalition. Political analysts opine that some parties are going for third front to earn votes in their region. People may vote for these parties under the impression that their region will have power at center. It seems third front parties may not agree on choosing the PM candidate. There are unique challenges for third front government such as disputes among leaders and among different parties due to different ideologies. In the past, third front governments were formed and came into power in 1989 (National Front) & 1996 (United Front). But both these governments collapsed. If the third front is formed successfully, and if it gets a good leader, democracy will be deepened. As state parties will have power at center, there will not be too much control at central government. Afterwords :- Who do you think will win 2019 Lok Sabha elections? Express your thoughts in the comment section below. Subscribe to our blog to read answers to trending GD topics. According to me BJP will win the 2019 Lok Sabha election. First of all BJP they are the largest party in India .Yes Congress is there but nowadays they are not very strong. Modiji has the personal image and as a prime minister he is successful and he is the very popular prime minister in all over the world , people personally like him. And other party this type of leader is not there . Supposed third front will get the vote then who will be the prime minister ? Different people different opinion for a long run they will not be able lead the country they will be busy with internal quarrel then when they will take care the country? BJP has the Strength. Modi government last five there was no corruption . We know Modiji implement GST as a result Indian economy is getting strong and people they have change their mentality they have to pay the taxes. Most of the people they have stopped their hide and seek business , they have to straight as a result revenue income is increasing. As govt has the sufficient money for country development. Modiji’s clean India program more or less successful. Make in India also is going on . Digital India also life is getting very easy. People sits in the room and they are able to all the work they don’t need to go to outlet , people they don’t want to carry cash rather they like to use plastic money even people they don’t need to go to grossery shop to purchase their monthly grossery they can order and get the materials delivered in their house , life is getting very easy. Most of the common people they are habituating for plastic money. Most of the peoples are computer literate in remote area also. So Modiji is the successful prime minister. So we should give him chance for next 5 years then hope he will eradicate poverty , illiteracy and corruption our India will reach in very good position.